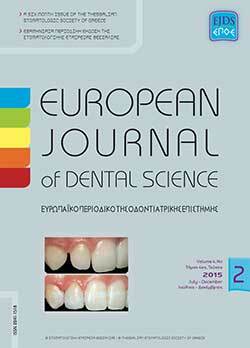 The European Journal Of Dental Science is the official biannual publication of the Hellenic Stomatologic Society of Thessaly, formerly known as “Odontostomatologic News”. It is a multidisciplinary peer-reviewed dental journal publishing articles in the field of dentistry. The European Journal Of Dental Science encourages submissions from all Authors throughout the world. Manuscripts are judged by two experts solely on the basis of their contribution of original data and ideas and their presentation. All manuscripts must comply with Instruction to Authors. The following articles will be considered for publication: editorials, original articles, reviewers, brief communications, case reports, and letters to the editor. Submitted manuscripts must not have been previously published, accepted for publication or be under consideration elsewhere. Investigation on human subjects should conform to the guidelines noted in the declaration of Helsinki. All articles will be critically reviewed by the editor and invited referees within 2 months. Attention is drawn to the Declaration of Helsinki and the Guiding Principles in the Care and Use of Animals (DHEW Publication, NIH, 80-23). Where applicable, ethical committee approval must have been received and details of such approval included in the text. The editor reserves the right not to accept papers unless adherence to the principles embodied in these documents is apparent. The attention of authors is also drawn to the CONSORT statement on randomized controlled trials.